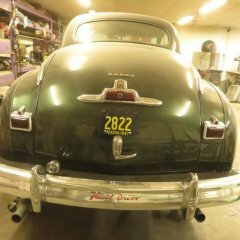 My '47 Windsor won't automatically upshift, I originally thought it might be electrical but I have checked the system and all seems well..... If I remove the interrupter and build the revs up in 3rd I can see the piston slide forward in readiness for a shift but it never actually shifts into top so I suspect the hydraulic side is ok also. I suspect that for some reason the shift slide (or whatever it's called) just isn't engaging. Are there any walkthroughs on inspection of this or will I just have to use the manuals? Nice set of nos seat covers, they look in great condition. Good thing the seller took them out of the box first. I bought a set years back at a swap meet, but they must have gotten wet over the years in storage and were full of mold and mildew after unboxing them for the first time. The efi plumbing is done! The lines in the engine bay will get attached to the firewall once the cab is back on. Now on to wiring for the pumps and the ecu. 1946 Chrysler Windsor transmission swap? 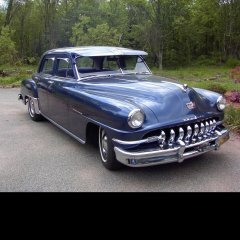 My motor in my 1940 chrysler Is a 265 from a 1954 windsor which I was told to be fluid drive. The motor is mated to the stock 3 speed from the 1940. The only issue I have is down shifting isn't great, grinds if going to fast but could be because syncros are worn? I fabricated a padlock lockbox out of some scrap metal I had gathering dust. Since I hunt 60 to 100 miles from the nearest road I've never had a desire to carry out a 200lb moose hide. + I have no idea how much it would cost to tan but I'd imagine it would be quite a bit. Greg, let me know. Maybe do a little lake tour? DerbyDad, could we squeeze in with your club? We are planning to attend again this year. Thinking about spending the weekend before up in the U.P. of Michigan, with a possible visit to Mackinac Island. Notice that they have the car show planned for Thursday, with awards banquet as a brunch on Friday, so that everyone is free to participate in the Cruise Friday afternoon and Saturday. They are also working on securing a parking area along the route for club members to park and watch or cruise. We'll probably leave Saturday afternoon and head to Ludington, to catch the SS Badger car ferry back across Lake Michigan on Sunday morning. Yeah, tighten them after you’ve tightened them to the block. You don’t have to over torque them. Don’t ask how I know how easy it is to crack a manifold. The two axle shafts but up against a thrust block in the middle of the differential. When you set the preload/end play of the bearings you are pressing the two bearing cups against the bearing cones, which push the axle shafts against each other, against the thrust block. When you set your end play with shims you have to do both sides together. Have you tried Moose hide? 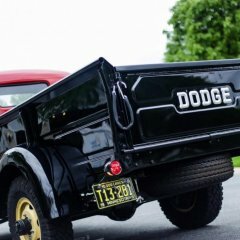 1979 Dodge Other Pickups Lil Red Express On Ebay https://www.ebay.com/itm/1979-Dodge-Other-Pickups-Lil-Red-Express/153461735317? I'm pretty sure all the components you are worried about come in 12V, DodgeB4ya would know for sure. 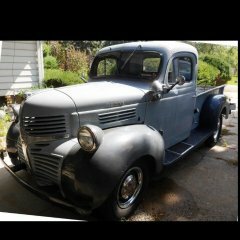 Hello everyone I tried searching the forms and I can’t really find anything I got a 1946 Chrysler Windsor With a fluid drive transmission I had swapped the car over to 12v thinking it was best but that was a rookie mistake I made at the being of my build years ago, I was considering using a 12v to 6v Reducier so I could retain the the fluid drive But I don’t wanna take a chance frying out the Solenoid or the governor , or ignition interrupter as they are up in price , i’ve been driving the car for a few days as if it were a regular Standard and it was working great until today I can put it in high gear , only in reverse or low gear , So my question is is there anyway I can put a three speed standard transmission in the car , I still have the stock flat head engine in the car . Any thoughts will be much appreciated . If you watched my video I posted earlier, you’ll see a tapered roller bearing pressed on to 1 axle shaft. I am feeding grease into it. This bearing is cone shaped. It has no outer race yet on it. Also known as the cup part of the bearing. The axle shaft with outer bearing pressed onto it is placed inside the axle housing. It is held snugly at the diff end by the inner bearing and splines. The outer end, tapered bearing cone pointing outward, needs a home to rest and support the axle. The tapered bearing cup gets pushed into place and seats nicely against the cone roller bearing. How tight you push the cup in, or not, is restricted by the shims. You are pushing the cup into its final resting place against the cone when you bolt down the brake backing plate. After everything is bolted down, the play you feel on the axle when you push/pull on it is the clearance between the bearing cone and cup. Pull you axles. Clean an inspect the outer bearings. You’re in that far, I’d replace the bearings with new. New inner & outer seals too. New brake backing plate dust seals too. Well, then you’re in that far. Hows the brakes? Lol. How about the diff housing gasket?...All a great learning opportunity.